Readers have made the point that my bespoke commissions often seem to be rather outlandish pieces: the Huntsman shooting suit, for example, or the Timothy Everest velvet jacket. 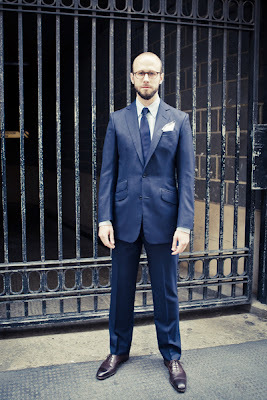 Why, at least one has asked, do you not have simple business suits made? The answer is I have but I tend not to write about them, because the others throw up more interesting points – both of construction and taste. As a point of balance, I show here a navy pinstripe suit I had made at Timothy Everest a while ago. It is a single-breasted, two-button model with a right ticket pocket that overlaps the hip pocket (one of Tim’s signatures). Other than the ticket pocket, it is free from any stylistic flourishes. The gorge is deliberately high and the shape quite sharp at the waist, but the shape elsewhere is quite classic. Fifteen inch hems on the legs; strap-and-buckle adjustors on the trousers; deep purple lining. The cloth is a nine-ounce merino wool from Loro Piana. Although not the best weight for longevity, it has a lovely handle and has proved wearable on even the hottest days in the City. This not being one of those days, it is worn with a cashmere/cotton mix shirt from Turnbull & Asser, heavyweight silk tie from Drake’s and linen handkerchief from Simonnot-Godard. While there’s nothing wrong with using the Italian Background combination of navy on blue for the tie and shirt, even with a navy suit, a little variation in the textures, such as the wool-mix tie, adds a touch of interest. More on the Italian Background here. You can follow the discussion on A plain business suit from Timothy Everest by entering your email address in the box below. You will then receive an email every time a new comment is added. These will also contain a link to a page where you can stop the alerts, and remove all of your related data from the site. – The button stance and jacket length seen quite conservative. More so, it appears, than your other commissions. I think it very lovely. Looks a bit rumpled, could do with a bit of a press. Not keen on the shoes. Still overall, a nice safe look. Up to you on the lining. Matching is conservative but can be nice; bright red or blue can be a little jarring; personally I prefer dark, sophisticated colours these days, like a mossy green or burnt orange.